Head north of Cabo San Lucas into the wilds of the Baja, where the tiny pueblo of Sol de Mayo awaits you. 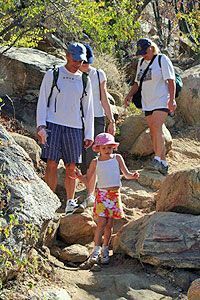 Your expert naturalist guide will show you the trail, and open your eyes to the amazing nuances of the desert landscape. In the autumn, you'll see the desert flora in bloom, filling the valleys with color. Keep an eye out for lizards, roadrunners and maybe a coyote, along with many species of indigenous birds. Reach the river and walk along it as the shimmering granite walls of Fox Canyon open up to reveal a magnificent 50-foot waterfall, cascading into the placid pools below. 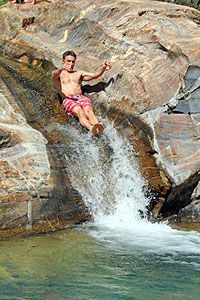 We can relax and swim in these refreshing pools, sliding on natural waterslides, jumping off the cliffs, and taking breathtaking photos of the waterfall. So refreshing! We'll eat lunch at a local restaurant nearby, then head back to Cabo San Lucas. A totally off-the-beaten-track tour in Cabo! The best time of year for this tour is October-April, especially in the fall when the autumn blooms abound.